This 14K palladium white gold ring has a twisted design and one 7x5mm oval topaz set in the center. 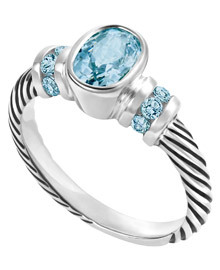 There are eight 2mm round blue topaz set into the shoulders of the ring. This ring is made from Harmony Metals and is available in sizes 4 through 9.